If you find this website helpful, please consider a donation to its running costs. Donors will be thanked via Twitter. Signal meters have always been a funny thing. ITU-R define S9 as -73dBm in a 50 Ohm system. So is your S9 the same as my S9? My first job as a Test Technician taught me how to calibrate the company's products against our NAMAS traceable test-equipment. If you ask me about an S-meter, I will have to respond with "Indicative use only!". 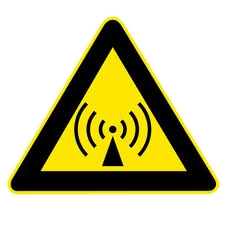 That is the sticker you will find on any equipment that is out of calibration. Why indicative? As I have found over the years, setting S9 against -73dBm on various CBs and Amateur rigs does not mean the other S-points will be accurate. A few years ago, my CB of choice was the Intek M-495 Power, and I operated one in the home and one in the car. The inclusion of CTCSS (although technically not legal to use in the UK on the CB frequencies) was a useful way of driving the squelch in a world with increasing interference (QRM) from the noise-sources listed on the UKQRM website ... as long as the other people you are talking to had a CB with CTCSS! The external S-meter socket offered a chance for experimentation. With an RF signal generator, I set about recording the output voltages against the ITU-R levels for S1, S2, et al, up to S9+30. 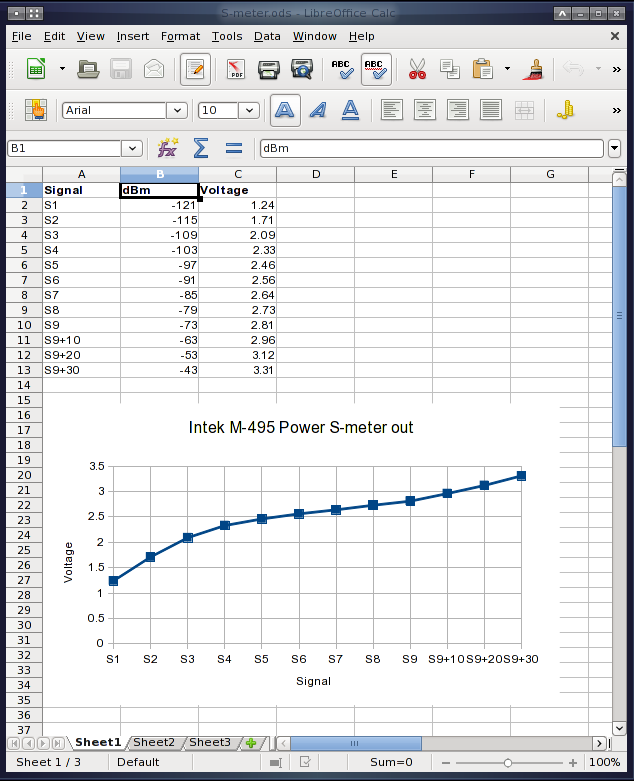 The results, once fed into LibreOffice, produced an interesting graph. The RSSI response of the receiver-chain was non-linear. Of course, this revelation only came about after I had experimented with little RSSI circuits based around the LM3914/LM3915/LM3916 bargraph drivers. I took inspiration from their internals and set about designing a larger system of comparators that could have their switch-over levels independently set. 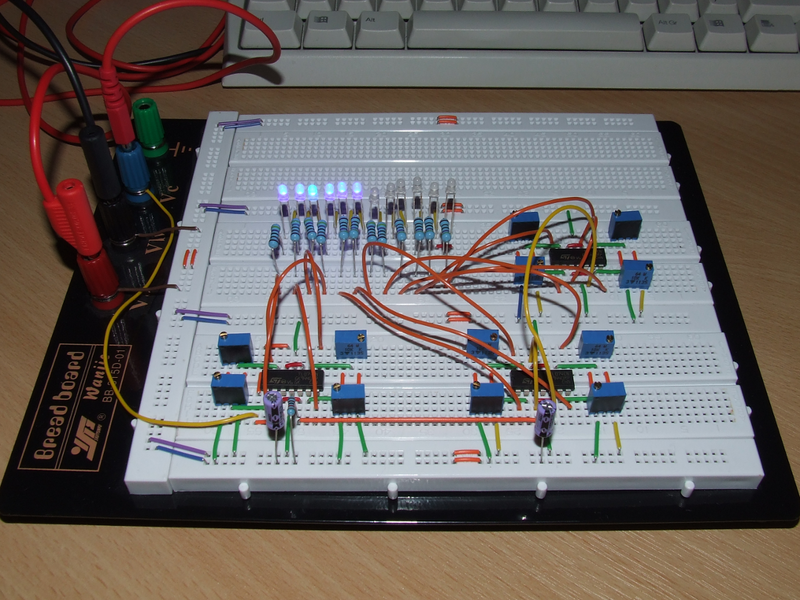 I came up with the following design based around three TL074 quad Op-amp chips used as comparators. Click on the image for a larger version. The above is revision 1.1 of the design. The first version did not feature the 9V regulator and I found, when operating from a battery, that the drop in supply voltage affected the comparator switching levels. The 9V regulator provides a fixed reference voltage to 'calibrate' against. The 10k and 10uF capacitor/resistor combination provide a delay circuit and remove any noise/strobing effects from the received signal. I built the first version on plug-board to prove the concept worked. One of the 'banana' plugs on the left is being fed by the external-meter connector on the Intek M-495. Click on the image for a larger version. I set about designing a printed-circuit-board to produce two main boards and two display boards from one piece of pre-sensitised copper-clad fibreglass board. The layout was designed to fit inside a certain sized plastic box. 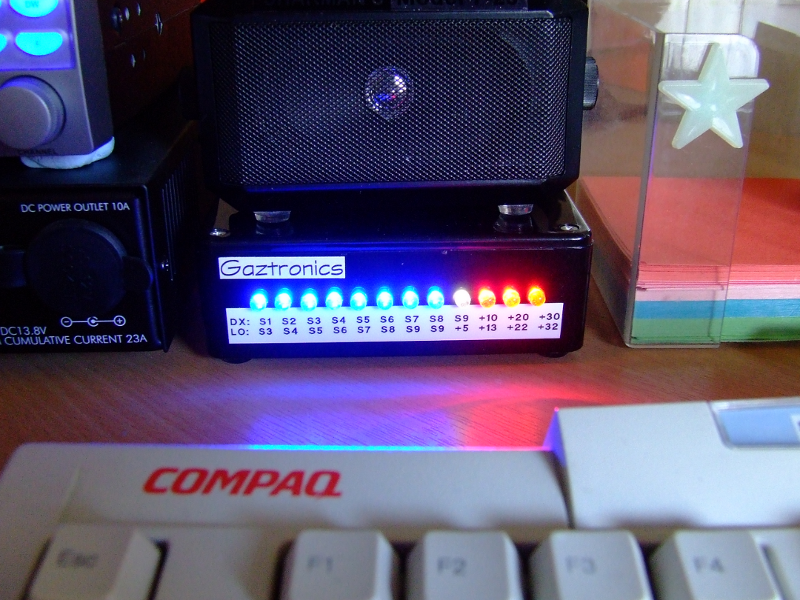 If I was to create a new version, I would set the LEDs on the main board and use a better box. 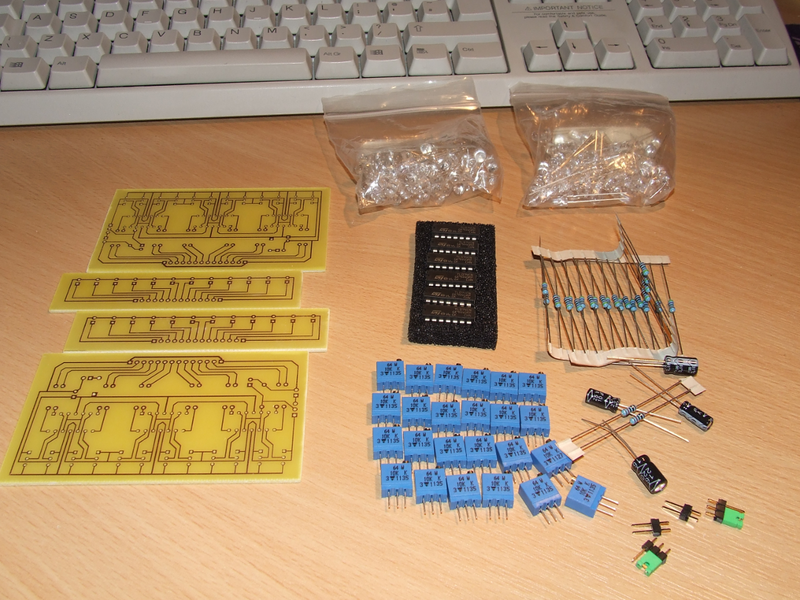 With the PCBs made, I set-out a kit of parts. Click on the image for a larger version. 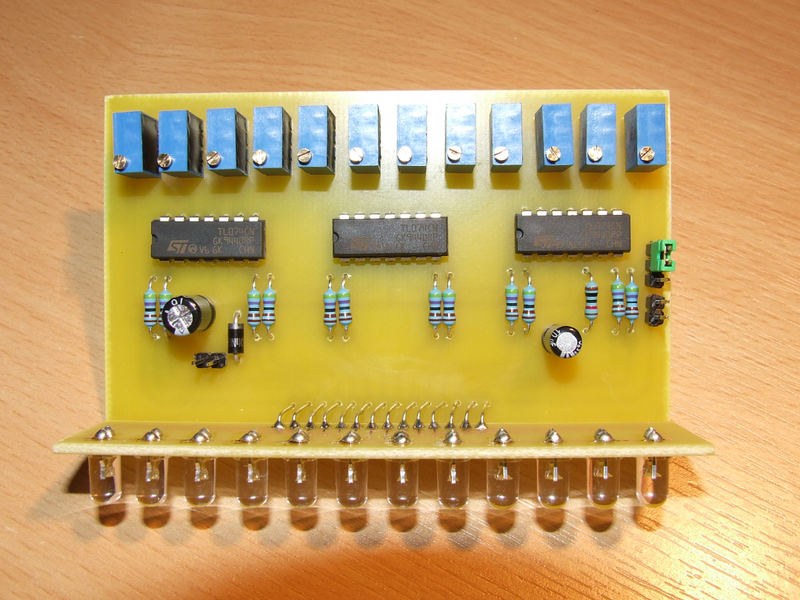 Observant viewers may notice this design does not feature the voltage regulator from the schematic. These were version 1.0 designs that showed-up the issue once in service. They had the 3-pin regulator added later. After modification, all 12 of the potentiometers had to be re-calibrated. Here is a completed board. Using up spare 20cd blue, white, and 12cd red LEDs required the use of 4k7 current limiting resistors to ensure I did not go blind! Click on the image for a larger version. And here is one of the completed RSSI meters providing a 'calibrated' signal level for the Intek M-495 CB. The two levels on the "calibrated tape" (as a friend called it) correspond to the DX/LOC switch position on the radio. And here it is with a very strong local signal. 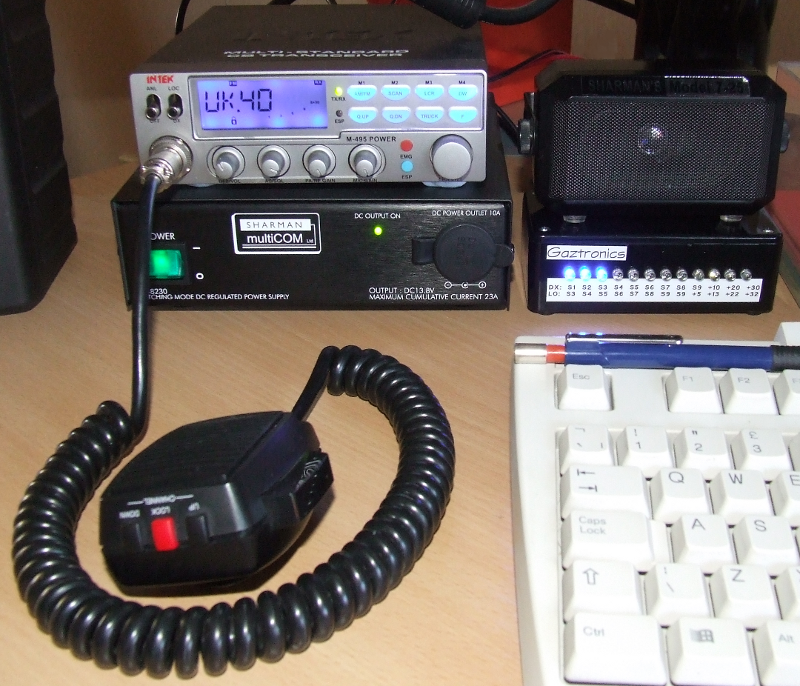 The meters are currently not in use as I no longer have a Citizens' Band radio; and my Yaesu FT-991A has a computer driven display. Should I ever return to CB, a radio with an external RSSI meter drive will be required! I put the schematic together in the Linux PCB program. You are welcome to download the layout files and play around yourself.